Spiders are, suprisingly, not a creation of the Empire. Instead, they evolved on their own, developing a camoflage system to survive in the deep tunnels beneath the Eighth's surface. When Smitemasters first reported their existance, they told that spiders easily blended into floors of light-blue colour, such as the former "Palace" style's flooring. Of course, their camoflage made them near impossible to detect. Angry Smitemasters and dungeon owners were outraged at this, so in approximatly 148 B.D., the Dungeon Architects' Association announced the recall of the Palace style with the new "Foundation". While many groups of spiders died off due to their lack of camoflage and, subsequently, defense, many groups managed to evolve and camoflage to any floor type. Today, Smitemasters regularily report of near-death encounters with spiders, as uncautious exterminators come face to face with a spider after watching it appear from out of nowhere. 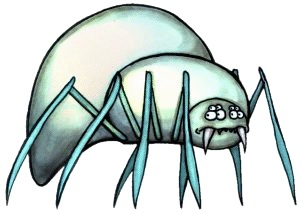 Spiders are very uncommon in Empire-controlled dungeons, since spiders are not under the Empire's control. While they will happily eat an Empirian citizen, they would rather eat an above-grounder when given the choice. Spiders use the exact same movement logic as the common dungeon roach, but their visibility is what Smitemasters are concerned about the most. The most common spiders are only visible from 30 feet away, or when they move. This means that Smitemasters need to keep a watchful eye to spot spiders, make a note of where they are, and work around them until they come close. The only other crucial difference is that spiders are able to traverse shallow water.